Become A Faster Runner With Andrew Bumbalough | Run S.M.A.R.T. NEW YORK (June 11th, 2014) — Professional distance runner Andrew Bumbalough has teamed up with legendary coach Dr. Jack Daniels and The Run SMART Project to offer his 5k training plan to the world. 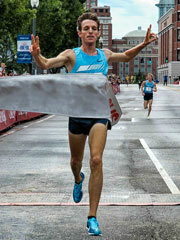 Bumbalough, the 2013 U.S. Road 5k Champion, has unveiled all of his training secrets to help other runners get faster. Competitive distance runners of all ages can now do the same workouts as Bumbalough but at the appropriate paces thanks to Daniels and his famous VDOT formulas. On your VDOT training calendar you also get to watch videos of Bumbalough training and providing tips while you follow your plan. Signing up is simple: Purchase the plan and begin customizing your schedule by selecting your goal race/date, how often you want to train and when you prefer to do the longer/harder workouts. The VDOT O2 app will then personalize the paces for all of Bumbalough’s workouts. Bumbalough holds the Tennessee state record in the 1600m (4:05) and 3200m (8:46). He was runner-up at the 2004 Foot Locker National Championships and went on to become an All American at Georgetown University. As a Nike-sponsored athlete he’s posted PRs of 13:12 for 5k and 3:56 for the mile. In 2013, he won the U.S. Road 5k Championships. In 2012, he finished 4th in the 5000m at the U.S. Olympic Trials.